Playing a game and watching the other players | theraceforthecafe.com . Strava was launched in 2008, as a location where cyclists (and runners) can record and share their activities, and which now is estimated to have over a million users worldwide (Strava are a bit coy about realeasing accurate user numbers). As many blog readers will know Strava allows users to record and share their cycling activities, as well as to explore the activities of others. Watching and being watched - and sharing on Instagram ! What is significant about Strava and how differs it from other physical activity tracking applications is that Strava provides opportunities to users for social interaction (comments and Kudos and sharing pictures) and crucially, competition with others through the incorporation of elements of gamification and surveillance. These two elements are key to understanding Strava and its effects so bear with me while I spend the rest of this post talking about them! The process of gamification involves attaching, as Strava have done, video-game like elements such as leader-boards, achievements and awards for various activities in non-game contexts. Gamification can result in increased motivation and significant changes in behaviour and has become commonplace almost to the point of being an expected element of any social media or information based non-game application. The term gamification was first used in academic literature by Van Benthem (2002) in a discussion of logic games he suggested that ‘in principle any logical task can be gamified’. Van Benthem used the term gamification to describe the presentation or conversion of non-game tasks into a game and this remains a common understanding of the term. Gamification has however, been a highly contested term to the extent that its entry on Wikepedia has been questioned, removed and re-instated, and discontent within the gaming industry of some interpretations have led game designers to utilise different terms. The integration of game design elements in Strava is an effective way of making the use of the application more enjoyable, motivating and engaging. Video games are explicitly designed for entertainment and as we all know they are capable of motivating users to remain engaged in an activity with increased intensity and duration. Above - Jack and Tom at a training camp in Majorca, the garmin is connected to the laptop and even before changing or eating they are uploading their Strava ride data straight after training - a scene that was being replicated by 10 other riders around the villa - wherever they could get a Wi-Fi signal. Gamification relies on quantification, on the monitoring, measuring and quantifying of users’ everyday cycling activities, and this data collection enables a cycle of feedback to operate which results in behavioural change instigated by game play. Gamification on its own would have little or no effect on cycling and cyclists if it was not for Strava’s other key element – surveillance. 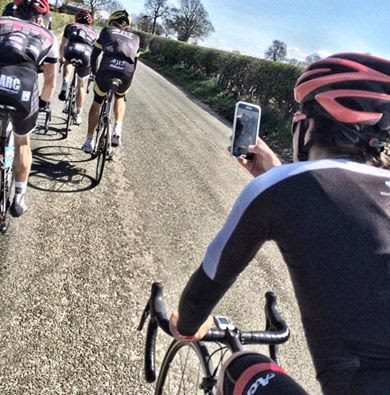 Surveillance is an intrinsic element of game play, and is at the core of the appeal of Strava to racing cyclists. In a gaming setting surveillance is utilised to gain knowledge of an opponent’s play, to improve a player’s chances of progress and success. For many racing cyclists the post-ride analysis of ride data enabled via Strava, is increasingly becoming an essential part of the cycling experience. (I know this from my research but crucially also from personal experience). I will return to the topic of surveillance in future posts but at this point I should probably elaborate a bit (trust me – this is the short explanation!) 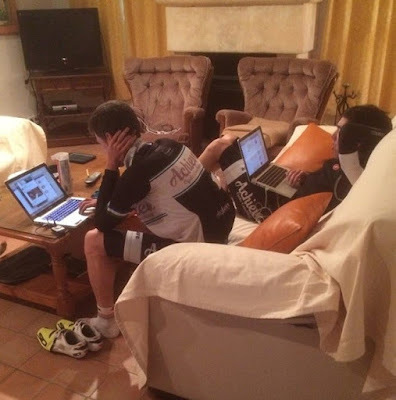 The form of surveillance, that we all do on Strava - you know it’s true - can be described as being lateral (cyclist to cyclist), participatory (as an element of the game that all Strava users are playing) and as social (because it is form of social interaction - online). While surveillance is often regarded as a form of control or discipline, think surveillance/security cameras, it can also be a form of entertainment, think I am a Celebrity – Get Me Out of Here or Goggle Box (NOTE for the record: I have never watched either of these programmes). The lateral surveillance that takes place on Strava is between two parties who are often both the watcher and the watched (following/followed by). 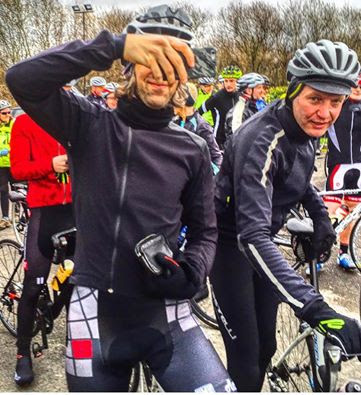 Above - One of my tean mates Richard Jones takes the KOM for the steep descent of Carlton Bank - well done Richie! - and hopes his Mum doesnt have him under surveillance! Why does surveillance matter? I hear you ask, because surveillance changes behaviour. How? The answer is going to take a couple of blog posts and I don’t want to ramble on too much at this stage but if you think about surveillance cameras in the street there is plenty of evidence to show that they lead to a reduction in disorder and anti-social behaviour. The reason is simply that people believe that they are being watched, even if they are not, the camera may not be switched on, the control room may not be manned, the footage may not be recorded? But the person in the street doesn’t know for sure. 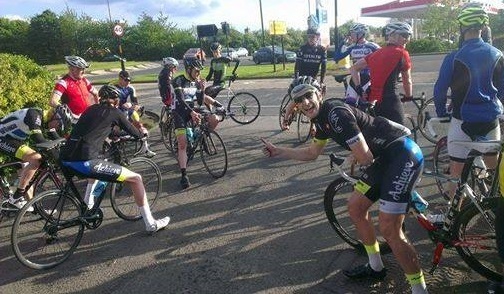 Cyclists are in a similar position on Strava they change their behaviour by riding further or faster (particularly over certain segments, you know who you are!) because they feel that they are under surveillance and they think their followers may be watching them. These need no clarification. Card recreations are ever well known with the gaming populace. There are a ton of amusements planned with playing cards. There are a number of ways that someone can start down the path of a game testing career. In fact, many people are already starting down that path, trying to learn what they can do to become a video game tester and then move on to even better careers in the industry. My research and the violence I witnessed. Strava Kudos explained: Is it a gift? Or a bribe?